If you are looking to purchase a meat grinder, the STX International STX 3000 MF Megaforce Electric Meat Grinder will meet your needs if you like the idea of a powerful air cooled motor. The air cooling feature sets this meat grinder apart and can potentially add many years of life to your grinder. The STX meat grinder comes as a standard size 12 unit and is made from cast aluminum that is food grade as well as polished, so not only does it look good, it is a quality build. The grinding blades and cutting plates come in matching sizes with the grinding plates made from tempered steel, while 304 grade stainless steel has been utilized for the cutting plates. Attachments also include three tubes for stuffing sausages and a kubbe attachment. The grinding plates and cutting blades have been manufactured in fine, medium and coarse sizes and when used together in matching pairs, ensure that the blades remain sharp. This particular design feature is also used to add speed to the grinding process. Using a matched pair of blades and grinding plates is also said to provide a more precise grind to your meat. The unit will grind 175 to 225 pounds per hour on high speed and 100 to 140 pounds per hour on low speed. Quite a lot of ground meat for a typical family. Cutting Blades – 3 are included and these can be matched with like sized grinding plates, that is, fine medium or coarse. They are made from stainless steel. Using a matched cutting blade and grinder plate assists in keeping the blades sharp and also works to provide a more precise grind. Sausage Attachments – three sausage tubes as well as a kubbe attachment are included so that you have plenty of size variations to choose from when making sausages. What’s Great About the STX 3000 MF Megaforce? 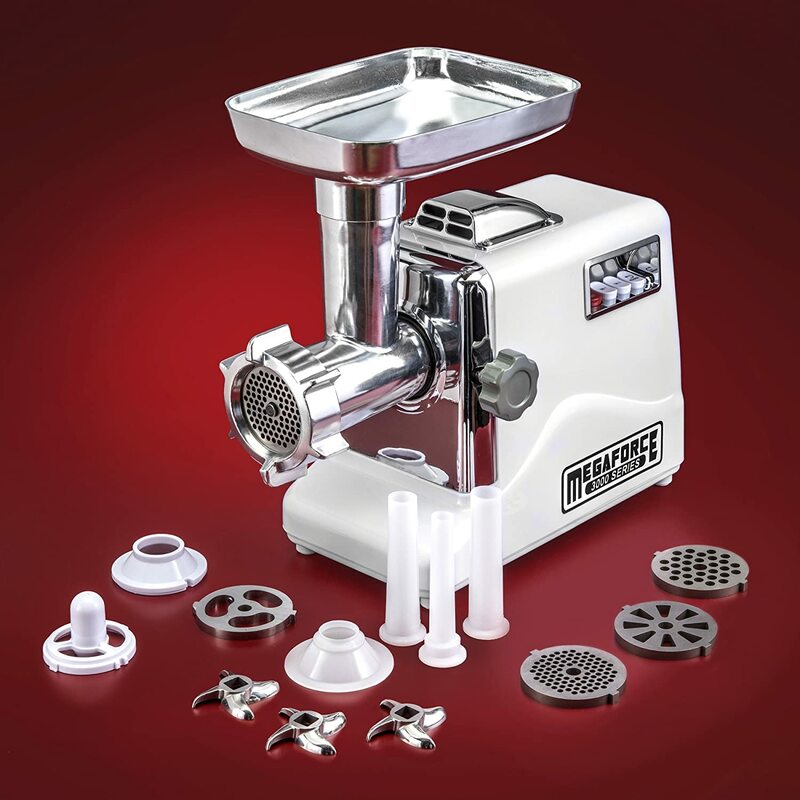 The STX MF Megaforce Meat Grinder is a popular grinder and we give it and outstanding rating. Things we like about it include its easy to use functionality, quiet operation, generous number of included attachments and sturdy build. We are also impressed with its competitive price. The warranty service is also excellent. Some purchasers had issues with this grinder, mostly when trying to grind small bones, but this is a minority. To read more about what customers have to say, you can read their reviews here. The STX 3000 MF Megaforce Electric Meat Grinder is available from online retailers and you can see the latest price for it here. The reliable and efficient performance of the STX meat grinder, together with its competitive price and warranty, proved to be major considerations for customers. Based on our review an customer feedback, we are pleased to recommend it as a value meat grinder.